Mexico Lindo y Querido, your capital rocks! Mexico City is such a vibrant city with such diversity. Visiting the capital is definitely a BIG MUST when going to Mexico. Soooo, if you are ever flying to Cancun, Oaxaca, Los Cabos, etc, and have a layover in Mexico City, DO make sure to try to extend it for a couple of days, or even better, make a whole trip out of just visiting this exciting city. 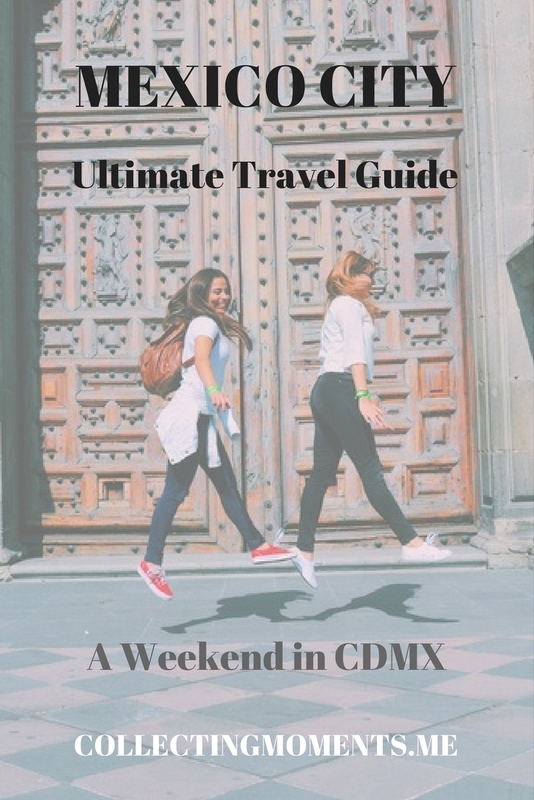 Mexico City is great in that many airlines have direct international flights there, and if you’re flying from the U.S., chances are you can score a great deal if you keep your eyes out! I’ve been to el D.F (as Mexicans call it, short for Distrito Federal) three times, and on each occasion, I have bought my airfare on special deals and I haven’t paid more than $300 USD. P.S – on my last visit with Guillermo, we paid with miles + $85 USD each for round-trip tickets – how insane is that!?! From the airport - I highly recommend paying any of the taxi kiosks the fixed rate and riding one of their taxis to wherever you are staying in the city. It’s the safest and most reliable way guaranteed for a ride from the airport. Around the city - Getting around the city has become increasingly safer and easier. We used Uber most of the time, and it worked great.We didn’t have working cells, but we would just call the Uber whenever we had Wifi, and it never failed us. Also, we stayed in La Condesa neighborhood and walked to many bars and restaurants close by. I prefer to stay in an Airbnb anytime I get the chance as it makes me feel like I’m a local, even if it’s just for one night. We rented an Airbnb in La Condesa neighborhood, and it was amazing!! Our studio apartment had everything we needed; the location was wonderful, and our host was great! Other neighborhoods I would definitely look into staying in on my next visit are Polanco, Colonia Roma, and the Historic City Center. We actually spent one night in a boutique hotel in the Historic City Center, Historico Central, when we had a one-night layover before flying to Puerto Escondido, and I would highly recommend it to anyone! Breakfast was included, and it was amazing traditional Mexican food. The hotel was located only a few blocks away from El Zocalo and El Palacio de Bellas Artes, and the staff was outstanding. I had done A LOT of research on where I HAD to eat on my visit, but once I was there and started walking in La Condesa, we decided to just go with the flow. All the places we ate were super good, and I will briefly list them, but honestly in such a big city with infinite choices, I recommend finding a place whenever you get hungry that gives you a good vibe! Aimee – This small café was right underneath our apartment, and it was perfect for our much-needed cup of coffee first thing in the AM (or in my case, almond milk latte) and a fresh croissant. It was quaint and perfect. Azul Condesa – This spot serves authentic, trendy Mexican favorites with a gourmet twist. The décor was lovely. We ate freshly baked Mexican breads, and then each one of us ordered an item off the brunch menu- ALL delicious! P.S – This was one of few restaurants we visited that had a varied and yummy vegetarian menu! Nonna – Modern Italian restaurant in La Condesa. We went in the early evening and decided to eat there because of the young and hip crowd. We shared delicious flatbreads and some appetizers! Pata Negra – This place is a tapas bar, but at night it is a very hip place to go drink and dance. The only downfall is that it’s small, and it gets very crowded, but no need to worry, as you can go bar hopping to ALL the bars right next to it in the area. In my opinion, the BEST thing you can do when you get to a new city is to spend some money on a ticket for a sightseeing tour bus if the city offers it. Getting to all the different monuments and spots in Mexico City is a lot easier if you are on a Hop-on Turibus. Also, depending on how many days you have in the city, this is a great way to see everything in a short amount of time. Mexico’s Turibus offers many routes you can choose from depending on your likes. But, if you are not into tour buses, that’s okay. I’ve listed in chronological order my favorites places. b. Palacio de Bellas Artes - where you will find murals by Diego Rivera, or you can attend a performance by the Ballet Folklorico de Mexico. 2. Castillo de Chapultepec – The National Museum of History is located inside the castle, and the castle sits on top of a hill with an incredible view of the city! 4. Walk around the trendy neighborhoods of La Condesa, Polanco, Colonia Roma, and Zona Rosa. 6. Teotihuacan Pyramids – if you have the time, set aside a whole day and go visit the amazing Mesoamerican pyramids. Take the local bus, and it will be a 1.5 hour trip each way, but completely worth it! 3. Go clubbing! Mexico city is supposed to have an incredible night scene, but I’ve always been tired by the end of the day and opted for chill bars instead.